203 mm/55 Mk143 х 3 pcs. 180 Degree Turn Time27.69 sec. 20 mm Oerlikon Mk426 х 1 pcs. 20 mm Oerlikon Mk2017 х 2 pcs. 20 mm Oerlikon Mk49 х 1 pcs. New Orleans — American Tier VII cruiser. The first U.S. heavy cruiser of the new generation. The key difference from the preceding cruisers was her remarkably reinforced armor. Taking into account her limited displacement, the ship boasted a successful balance of armament, protection and speed. New Orleans is basically a melding of Pensacola, Northampton, and Portland — currently represented by Tier VII Premium cruiser Indianapolis — and shows herself as a new shift in US heavy cruisers. A stocky ship, it should come as to no surprise that her armor is a vast improvement from Pensacola (not hard to do), allowing her to at least handle herself in cruiser duels. Her AA suite is also somewhat better, though it is not until Tier VIII's Baltimore that American heavy cruiser anti-aircraft defenses become truly fearsome. She has the same excellent gun performance as the Pensacola. When fully specialized for concealment she has a 10.6 km detection radius by sea. Despite this, pushing in at the beginning of a battle is an extremely hazardous proposition as her armor is still inadequate protection against battleships, especially considering her mediocre health pool. She must use islands and concealment to contribute in the early game without taking too much fire. 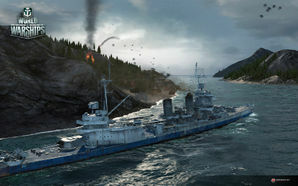 The later stages of the game can offer more opportunities to be aggressive, whether it is hunting down enemy destroyers or ambushing enemy cruisers. Decently armored; more capable of bouncing enemy shells than Pensacola. Solid main battery performance; reload speed is good for its tier, turret traverse speed is above average, and firing range is adequate. Excellent concealment (better than Japanese counterpart Myoko). Armor must to be angled to be effective against cruiser shells, and it remains very weak against battleship AP. Most of the anti-aircraft firepower is located in the smallest diameter bubble. Second slowest rate-of-fire of all non-Premium Tier VII heavy cruisers. Hull: Upgrade to Hull (B) for more hitpoints, more anti-air capabilities, and better rudder shift time. Research of this module unlocks progression to Baltimore. Gun Fire Control System: Upgrade to Mk7 mod. 2 for an extra 10% range on the main battery. Research of this module unlocks progression to Cleveland. Captains should grab Hull (B) first for the added health, then move on to the range upgrade. Slot 1: Main Armaments Modification 1 ( ) keeps her guns active and firing. Slot 2: Steering Gears Modification 1 ( ) keeps her rudder available for dodging incoming shells. Slot 3: Aiming Systems Modification 1 ( ) improves her accuracy. Slot 4: Propulsion Modification 2 ( ) increases her acceleration. Anti-Aircraft Build: Captains focusing on making New Orleans have better AA will opt for Auxiliary Armaments Modification 1 ( ) for Slot 1 to increase the anti-aircraft armament durability and AA Guns Modification 1 ( ) for Slot 3 to increase her medium- and long-range AA power. The usefulness of this build is dependent on whether there is a carrier in the game. The presence of an enemy carrier generally can be ensured by forming a division with a friendly carrier. Generalist Build: Captains focusing on making New Orleans a more well-rounded ship will opt for Main Armaments Modification 1 ( ) for Slot 1 and Aiming Systems Modification 1 ( ) for the Slot 3 to increase her accuracy. The poor range and DPS of the large caliber AA makes it not really worth it to choose Manual Fire Control for AA Armament, as the ship can reliably shoot down enemy strike aircraft with Defensive AA Fire ( ) alone. Captain focusing New Orleans on AA build will equip Defensive AA Fire II ( ) for the Slot 2, especially when in a division with a carrier. Although for solo playing, Hydroacoustic Search II ( ) is more recommended if there is no carrier around. Players who wish to spend doubloons can equip New Orleans with Type 17 camouflage that lowers her detection radius, reduces the accuracy of incoming shells, reduces her repair costs, and increases the amount of experience she earns. As the lead ship of her class, which was to be the last series of ships designed to abide by the Washington Naval Treaty, the USS New Orleans (CA-32) was among the first cruisers to be built with enough armour to stop 8in shells. Due to the time in which she was designed, the class name was considered unofficially as either the Minneapolis-class or more affectionately as Astoria-class. However, after the loss of Astoria, along with Quincy and Vincennes, in 1942 at the Battle of Savo Island, New Orleans became the official class name for the cruisers. Twenty-three cruisers were originally planned under a 1929 programme by the US Navy, but the due to the 1930 London Naval Treaty and already owning several 8-inch cruisers, they only produced seven of the New Orleans-class ships. However, this class had three distinct test designs, with the New Orleans, Astoria, and Minneapolis all belonging to one. As a result from these test designs, the class spawned the Baltimore, Brooklyn, Cleveland, and Wichita class cruisers. The final four New Orleans-class ships were scrapped 1959-1961. Permanent camouflage resembles the Measure 33/13D scheme, which was only applied to sister ships Tuscaloosa and San Francisco. New Orleans was painted in overall Navy Blue. In 1945 she was repainted with Measure 22 camouflage. No ships of the New Orleans class were ever fitted with twin mounted 40mm Bofors. The first Bofors guns to be fitted on the ships were already in quadruple mounts. The four quad 1.1" (28mm)/75 caliber AA guns that were fitted in 1941 is missing. These guns remained until late 1943, when they were replaced by six quad 40mm Bofors. 1943 ONI identification sheet for the U.S. Navy New Orleans-class heavy cruisers from the U.S. Office of Naval Intelligence. 1.1-inch (28 mm) quad guns on USS Astoria in 1941. This configuration is currently missing from the in-game New Orleans. This page was last modified on 19 February 2019, at 04:25.